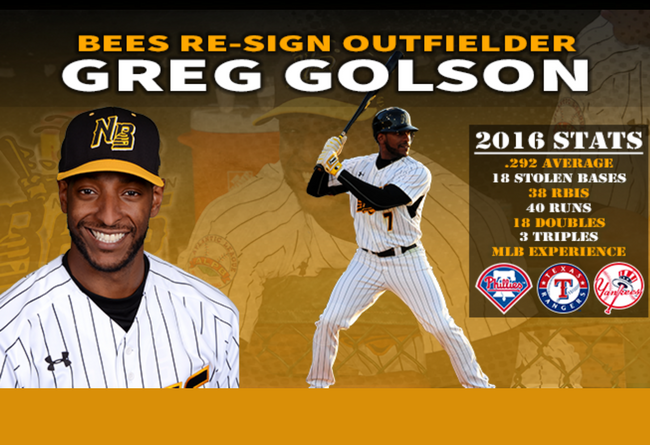 (New Britain, Conn., Feb. 17, 2017) - New Britain Bees team officials today announced that the team has re-signed veteran outfielder Greg Golson for the 2017 season. Golson becomes the sixth player to sign in New Britain for the upcoming season, and first with playing experience at the Major League level. Golson, 31, enters his second season in New Britain after batting .292 with 111 hits, three triples, and 18 stolen bases last season. A native of Austin, TX, Golson was drafted by the Philadelphia Phillies in the first round (21st overall) in the 2004 MLB Amateur Draft. The 6-foot, 190 lbs. Golson spent parts of four seasons in the Major Leagues with the Phillies, Texas Rangers, and New York Yankees, receiving a World Series ring with Philadelphia in 2008. In 13 professional seasons, including 40 Major League games, Golson has amassed 1,446 hits, 777 runs scored, 288 stolen bases, and a career .273 batting average, to go with 563 runs batted in and 73 triples. This will be Golson’s fourth Atlantic League season, and second with the Bees. Golson won an Atlantic League Championship with the Lancaster Barnstormers in 2014, while Bees manager Stan Cliburn was Lancaster’s hitting coach. Last season, Golson appeared at all three outfield positions for the Bees, primarily playing left field. Golson has tallied 174 hits, 88 runs, 59 RBIs, 31 stolen bases, and a .298 overall batting average in Atlantic League play.